Lubriplate, NO. 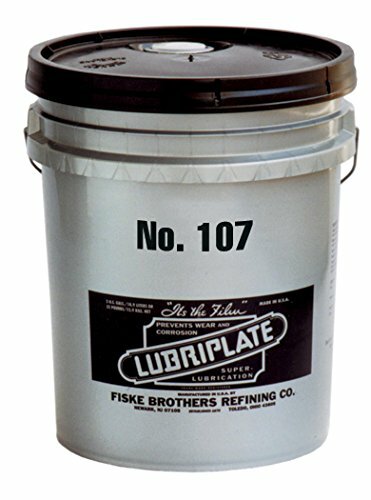 107, L0036-006, CTN 6/6 LB CANS The LUBRIPLATE "100" Series Products are excellent water-resistant lubricants designed for plain bearings, cams, slides and similar applications up to operating temperatures of 150°F. LUBRIPLATE No. 100 and No. 105 are excellent lubricants for coating engine parts when assembling either a new or rebuilt engine. They are excellent rust preventive greases. LUBRIPLATE No. 107 is an outstanding concrete form release agent because it does not stain the concrete. Also, LUBRIPLATE No. 107 is an excellent anti-seize compound for the threads on bolts which hold metal forms. LUBRIPLATE No. 110 is recognized as an outstanding brake lubricant. LUBRIPLATE No. 115 is the ideal water pump lubricant. These lubricants offer a long lasting film of protection for light duty applications. Typical Tests LUBRIPLATE No. 100 105 107 110 115 Type of Base Calcium Calcium Calcium Calcium Calcium Worked Penetration Semi- @ 77°F Fluid 355/385 310/340 235/260 175/205 Unworked Penetration 30 gram cone @ 77°F 365/375 ---------- ---------- ---------- ---------- NLGI No. 00 0 1 2.5 4 ASTM Dropping Point 170°F 170°F 180°F 190°F 210°F 77°C 77°C 82°C 88°C 99°C Mineral Oil Viscosity SUS @ 100°F 300 300 300 300 300 cSt @ 40°C 58 58 58 58 58 Character Smooth Smooth Smooth Smooth Smooth Color Off-White Off-White Off-White Off-White Off-White ISO-9001 Registered Quality System. ISO-21469 Compliant.